Get FREE gifts worth up to $1,000 in addition to Cashback Lucky Draw with the purchase of selected LG products. 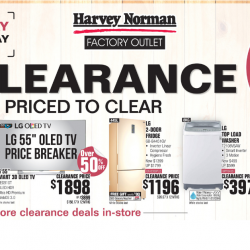 Freebies range from an LG Robotic Vacuum Cleaner (worth $799) to the LG Minibeam Nano Projector (worth $599), Music Flow Speaker (worth $249), grocery vouchers (worth up to $200) and LG Prepaid MasterCard Rebate (worth up to $1,000) amongst many others. So, come and hurry!